Packing up for my last year at college seems so surreal. I’ve had the most wild and magical past three years, and I am so excited to see the adventures this year holds: from my senior art exhibition, to studying abroad! I’ve partnered up with Babbleboxx to share some of my favorite back to school goodies that have inspired me to refocus and reorient my heart and mind to get ready for a new year at school. 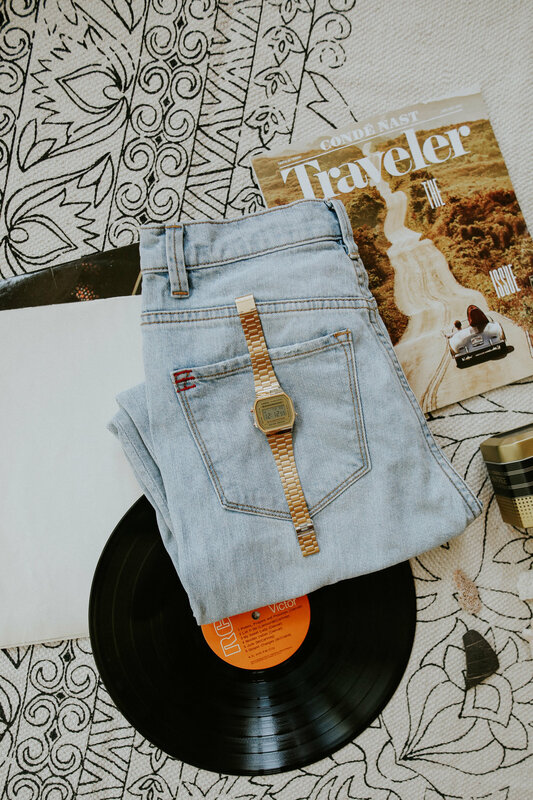 My Casio A168WG-9VT Vintage Watch from the Casio Vintage Collection is the perfect classic piece to help me stay stylish & on time for my classes, yoga, and shoots. The built-in alarm is perfect for making those 8:00am lectures, and the backlight is a great feature for late night study sessions. You can pick up one of these timeless timepieces at Macy’s and ShopCasio. Having quick bites in my room between classes has been the best way to fuel up during school. I’ve kept a few Big AZ Sandwiches in my mini-fridge for a quick lunch: in my room or on the go. I always like adding some greens & fruits to my lunch for a healthy boost! Some of my other favorite on-the-go snacks are a warm cup of organic tea + Non-GMO sugar, a CLIF bar, or a bottle of coconut water! EZneeds is a website that delivers your favorite dorm essentials right to your door (or on-campus mailroom). The fast + free 1-3 day shipping nationwide is perfect for when I know I’m going to have a busy week and might not be able to make it to the store! When I’m not in the art studio or hanging out with friends, I love having a good book in my bag if I have a few extra minutes before class, or need a break from studying. The princess saves herself in this one is a book about resilience and creating your own story. It was also the Winner of the 2016 Goodreads Choice Award for Poetry. Pick one up here. This year, I’m living with 5 amazing girls on campus in our 3 bedroom apartment. One of our favorite things to do together is movie night! After long days of workouts, classes, and homework, it’s nice to unwind once a week with some popcorn, sweets, cozy blankets, and good company. One of our favorite treats are Sour Punch Share Me!® Mini Bites, the perfect sour candy for sharing with friends. You can pick some of these sweets up at SourPunch.com. If you’re looking for a new way to snuggle up, try a microfiber blanket by Viv & Lou, and use code AllegraRose25 for 25% off anything on the site until September 30th, 2017 at http://www.vivandlou.com/gifts/dorm-gifts.html. Wishing all you dreamers a lovely fall as you embark on a new school year, or a new adventure.